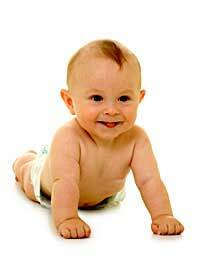 Many people do not think about it but babies often take on the personality traits of their astrological sign. This can be very useful in learning what your child needs and how to best react to those needs. Below are some of the basic things you may expect from your little bundle of joy. Aries is the sign of the Ram, so you can expect an active little baby. Sitting alone playing with a rattle probably will not happen with this one. This baby will be a noisemaker who is always up to something, perhaps to get your attention – Aries babies crave attention. It would behove you to help them learn to get along with others early on, as they will need to learn to share. Sharing does not come naturally to the Aries baby. This baby may begin to do things such as walk and talk early, so be prepared! Taurus babies loved to be touched, so be prepared to hold, hug, carry, and cuddle this little one. These babies also have a high need for comfort, so try to make sure their rooms are the right temperature, that their food is tasty, and that their toys make soothing sounds. Taurus babies tend to learn things at their own pace, so do not be distraught if they seem to be behind other babies and most importantly, do not push them. One thing you have to watch with Gemini babies is that they are often eager to get going with things and tend to get bored very easily. They require a lot of stimuli to keep them happy. They are also early talkers. If you can, get them involved with other children through a playgroup or daycare so they can get the communication and activity they need. Cancer babies tend to be a bit more emotional than most babies. You may find this baby crying quite a bit. Holding and touching them can provide the comfort for which they are looking. These babies are very in tune with their families and very sensitive to bad vibes, so try to keep the household yelling and arguing to a minimum. You may find that your Cancer baby is fussy about food, but just show a little patience until he or she finds something they like. Leo babies will definitely not let you forget they are around. They want to be the centre of attention and often use their cries as a way to achieve this. This baby loves to have an audience and the baby will probably turn out to be quite the little performer. Perhaps is it this love of attention and performing that makes them very competitive. However, the Leo baby makes friends quite easily and quickly, although they may have a hard time learning to share. Look for this baby to be the leader of the other children at playgroup. Virgos are often perfectionists and that starts at a very early age. You may find that your Virgo baby is precise, but setting up a routine can help this. Just do not change the routine! Virgo babies are not very fond of changes, so keeping things consistent can help keep the Virgo baby calm. They like a clean room and simple, but clean clothing. Once the baby gets big enough, he or she may want to help you with everything. Virgo toddlers are great little helpers. Your Libra baby will probably be passive, yet so charming that he or she will be the one everyone is “oohing” and “aahing” over. It may be the smile that wins people over or it may be that Libra babies are also even tempered and have a sweet disposition. Libra babies love to be around other children and socialise, so get them involved with other kids as soon as you can. Just like Leo babies, Scorpio babies want to be the centre of attention. Scorpio babies are powerful and will often expect the world to conform to their schedules. The Scorpio baby definitely knows how to work a crowd and get them to do what they want. They despise dirty nappies, so check them frequently. Sagittarius babies are very happy go lucky and free-spirited. They are also independent little tykes, who typically start walking at an early age. And when they do begin walking, watch out! They love to explore and hate to be confined. They are very friendly with other children and they love to travel, seeing new places and meeting new people. Capricorn babies often seem like little old souls – they are very disciplined and very organised at an early age. They take time doing things, so do not try to rush them. They will learn lessons slowly, but they will catch on, so do not worry. They respond well to a reward system, so consider that when trying to teach them. They also crave organisation, so getting them into a preschool early may help them along. Aquarius babies often come off as loners who are a bit detached. You may be shocked if your Aquarius baby does not require much attention or affection. But they can benefit from socialised settings. Family will come to expect the unexpected from this child, who is often stubborn and very independent. Like Cancer babies, Pisces babies can be quite emotional. It may be because Pisces often hold their feelings in or because they are so timid. And like Cancer babies, they are very sensitive to disagreement in the family, so try to avoid that. These children are very selfless, so mums and dads will have to keep an eye on them to make sure the children with stronger personalities do not push them around. These babies are also dreamers by nature, so they may often get lost in their own thoughts. Parenting is rarely an easy job, so knowing all you can about your baby and his or her personality can be of great help. You may even be able to use your child’s astrological sign to help prevent problems before they happen. You can also help nurture and education them in the way they understand the best. My D.O.B is 13.06.1991 (10.52a.m)and my partner is 27.06.1985. when can i have a baby? my dob is 30 06 1991 and birth time is 03.15 am my husband's dob is 12 04 1987 and birth time is 02.47 pm weboth are born at ahmedabad gujarat india. when will we have our child ? when is it a good time to conceive, second child, a boy. my DOB 1985/07/01 at 1.15 am .When can i have a baby?